OUR PRICE: $36.55 - Join Rewards Get $3 Dance Dollars On This Item! 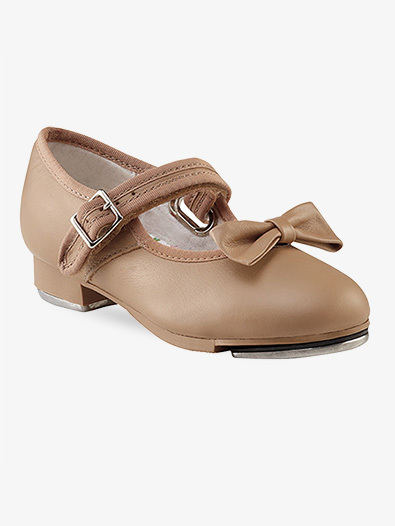 Capezio's child "Mary Jane" tap shoe features attached Teletone Taps, a velcro strap with an ornamental buckle, a 1" plastic "stacked" heel, a non-slip heel counter and a cushioned latex foam insole providing extra comfort. 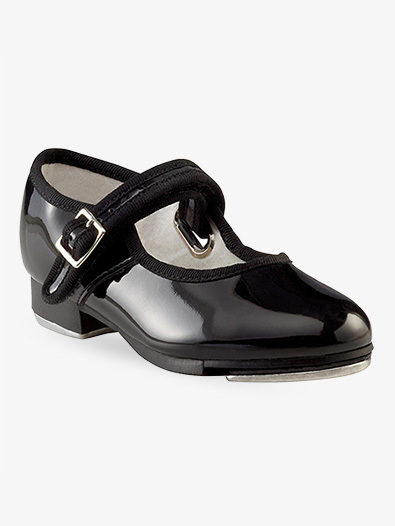 The Black Patent version features a PU upper and the other color versions feature a matte genuine leather upper. Clip-on bows are included! My 5-year-old loves these, especially the detachable bows. We had to return and buy them half a size bigger, and now they are perfect. She has wide feet and the W is a good width. They seem durable and well-made. I bought these thinking I would need a larger size, but they are the exact size of my daughter's street shoe, very true to size! i guessed on the size, choosing one size larger than my daughters street size. they fit her perfectly, although i should of ordered the narrow fit. the Medium width size actually fit a "medium" foot while normally a medium shoe is usually quite narrow. the bows that are shown in the picture are clip-on's and after only one dance rehearsal with my daughter, both bows had come loose, fallen off and were lost! my daughter was devastated. would of been nice if the bows were actually sewn on the shoes. the straps are Velcro; which worked out super great for my daughters quick-change on recital night! although the price is high, these shoes are worth it for a lover of Tap! This shoe is great. My daughter loves them. There is a soft cushion inside, which my daughter says makes it very comfortable. She loves the velcro because they don't come untied in the middle of class (or recital). Highly recommend this shoe!! I ordered this shoe a half size larger so they would last longer. They don't feel too big because the adjustable velcro allows you to tighten the shoe for a more secure fit. Worth every penny, these are the best! These tap shoes are great quality. They are long lasting and you don't have to worry about your daughters shoes getting untied. I highly recommend this shoe for any little girl or even an adult! A Quality Purchase! what does "N, M and W" refer to in the sizing chart? The letters refer to the width of the shoe -Narrow, Medium, and Wide. The bows are removable, they clip on.